You write reproachfully, my dear Bertie, and you say that absence must have weakened our close friendship, since I have not sent you a line during this long seven months. The real truth of the matter is that I had not the heart to write to you until I could tell you something cheery; and something cheery has been terribly long in coming. At present I can only claim that the cloud has perhaps thinned a little at the edges. You see by the address of this letter that I still hold my ground, but between ourselves it has been a terrible fight, and there have been times when that last plank of which old Whitehall wrote seemed to be slipping out of my clutch. I have ebbed and flowed, sometimes with a little money, sometimes without. At my best I was living hard, at my worst I was very close upon starvation. I have lived for a whole day upon the crust of a loaf, when I had ten pounds in silver in the drawer of my table. But those ten pounds had been most painfully scraped together for my quarter’s rent, and I would have tried twenty-four hours with a tight leather belt before I would have broken in upon it. For two days I could not raise a stamp to send a letter. I have smiled when I have read in my evening paper of the privations of our fellows in Egypt. Their broken victuals would have been a banquet to me. However, what odds how you take your carbon and nitrogen and oxygen, as long as you DO get it? The garrison of Oakley Villa has passed the worst, and there is no talk of surrender. It was not that I have had no patients. They have come in as well as could be expected. Some, like the little old maid, who was the first, never returned. I fancy that a doctor who opened his own door forfeited their confidence. Others have become warm partisans. But they have nearly all been very poor people; and when you consider how many one and sixpences are necessary in order to make up the fifteen pounds which I must find every quarter for rent, taxes, gas and water, you will understand that even with some success, I have still found it a hard matter to keep anything in the portmanteau which serves me as larder. However, my boy, two quarters are paid up, and I enter upon a third one with my courage unabated. I have lost about a stone, but not my heart. I have rather a vague recollection of when it was exactly that my last was written. I fancy that it must have been a fortnight after my start, immediately after my breach with Cullingworth. It’s rather hard to know where to begin when one has so many events to narrate, disconnected from each other, and trivial in themselves, yet which have each loomed large as I came upon them, though they look small enough now that they are so far astern. As I have mentioned Cullingworth, I may as well say first the little that is to be said about him. I answered his letter in the way which I have, I think, already described. I hardly expected to hear from him again; but my note had evidently stung him, and I had a brusque message in which he said that if I wished him to believe in my “bona-fides” (whatever he may have meant by that), I would return the money which I had had during the time that I was with him at Bradfield. To this I replied that the sum was about twelve pounds; that I still retained the message in which he had guaranteed me three hundred pounds if I came to Bradfield, that the balance in my favour was two hundred and eighty-eight pounds; and that unless I had a cheque by return, I should put the matter into the hands of my solicitor. This put a final end to our correspondence. There was one other incident, however. One day after I had been in practice about two months, I observed a bearded commonplace-looking person lounging about on the other side of the road. In the afternoon he was again visible from my consulting-room window. When I saw him there once more next morning, my suspicions were aroused, and they became certainties when, a day or so afterwards, I came out of a patient’s house in a poor street, and saw the same fellow looking into a greengrocer’s shop upon the other side. I walked to the end of the street, waited round the corner, and met him as he came hurrying after. He shuffled and coloured, but I walked on and saw him no more. There was no one on earth who could have had a motive for wanting to know exactly what I was doing except Cullingworth; and the man’s silence was enough in itself to prove that I was right. I have heard nothing of Cullingworth since. I had a letter from my uncle in the Artillery, Sir Alexander Munro, shortly after my start, telling me that he had heard of my proceedings from my mother, and that he hoped to learn of my success. He is, as I think you know, an ardent Wesleyan, like all my father’s people, and he told me that the chief Wesleyan minister in the town was an old friend of his own, that he had learned from him that there was no Wesleyan doctor, and that, being of a Wesleyan stock myself, if I would present the enclosed letter of introduction to the minister, I should certainly find it very much to my advantage. I thought it over, Bertie, and it seemed to me that it would be playing it rather low down to use a religious organisation to my own advantage, when I condemned them in the abstract. It was a sore temptation, but I destroyed the letter. I had one or two pieces of luck in the way of accidental cases. One (which was of immense importance to me) was that of a grocer named Haywood, who fell down in a fit outside the floor of his shop. I was passing on my way to see a poor labourer with typhoid. You may believe that I saw my chance, bustled in, treated the man, conciliated the wife, tickled the child, and gained over the whole household. He had these attacks periodically, and made an arrangement with me by which I was to deal with him, and we were to balance bills against each other. It was a ghoulish compact, by which a fit to him meant butter and bacon to me, while a spell of health for Haywood sent me back to dry bread and saveloys. However, it enabled me to put by for the rent many a shilling which must otherwise have gone in food. At last, however, the poor fellow died, and there was our final settlement. Two small accidents occurred near my door (it was a busy crossing), and though I got little enough from either of them, I ran down to the newspaper office on each occasion, and had the gratification of seeing in the evening edition that “the driver, though much shaken, is pronounced by Dr. Stark Munro, of Oakley Villa, to have suffered no serious injury.” As Cullingworth used to say, it is hard enough for the young doctor to push his name into any publicity, and he must take what little chances he has. Perhaps the fathers of the profession would shake their heads over such a proceeding in a little provincial journal; but I was never able to see that any of them were very averse from seeing their own names appended to the bulletin of some sick statesman in The Times. And then there came another and a more serious accident. This would be about two months after the beginning, though already I find it hard to put things in their due order. A lawyer in the town named Dickson was riding past my windows when the horse reared up and fell upon him. I was eating saveloys in the back room at the time, but I heard the noise and rushed to the door in time to meet the crowd who were carrying him in. They flooded into my house, thronged my hall, dirtied my consulting room, and even pushed their way into my back room, which they found elegantly furnished with a portmanteau, a lump of bread, and a cold sausage. However, I had no thought for any one but my patient, who was groaning most dreadfully. I saw that his ribs were right, tested his joints, ran my hand down his limbs, and concluded that there was no break or dislocation. He had strained himself in such a way, however, that it was very painful to him to sit or to walk. I sent for an open carriage, therefore, and conveyed him to his home, I sitting with my most professional air, and he standing straight up between my hands. The carriage went at a walk, and the crowd trailed behind, with all the folk looking out of the windows, so that a more glorious advertisement could not be conceived. It looked like the advance guard of a circus. 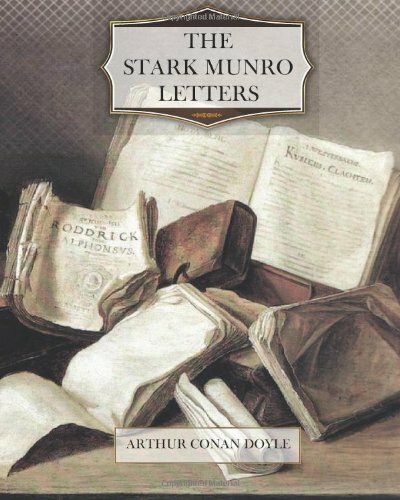 Once at his house, however, professional etiquette demanded that I should hand the case over to the family attendant, which I did with as good a grace as possible—not without some lingering hope that the old established practitioner might say, “You have taken such very good care of my patient, Dr. Munro, that I should not dream of removing him from your hands.” On the contrary, he snatched it away from me with avidity, and I retired with some credit, an excellent advertisement, and a guinea. These are one or two of the points of interest which show above the dead monotony of my life—small enough, as you see, but even a sandhill looms large in Holland. In the main, it is a dreary sordid record of shillings gained and shillings spent—of scraping for this and scraping for that, with ever some fresh slip of blue paper fluttering down upon me, left so jauntily by the tax-collector, and meaning such a dead-weight pull to me. The irony of my paying a poor-rate used to amuse me. I should have been collecting it. Thrice at a crisis I pawned my watch, and thrice I rallied and rescued it. But how am I to interest you in the details of such a career? Now, if a fair countess had been so good as to slip on a piece of orange peel before my door, or if the chief merchant in the town had been saved by some tour-de-force upon my part, or if I had been summoned out at midnight to attend some nameless person in a lonely house with a princely fee for silence—then I should have something worthy of your attention. But the long months and months during which I listened to the throb of the charwoman’s heart and the rustle of the greengrocer’s lungs, present little which is not dull and dreary. No good angels came my way. Wait a bit, though! One did. I was awakened at six in the morning one day by a ringing at my bell, and creeping to the angle of the stair I saw through the glass a stout gentleman in a top-hat outside. Much excited, with a thousand guesses capping one another in my head, I ran back, pulled on some clothes, rushed down, opened the door, and found myself in the grey morning light face to face with Horton. The good fellow had come down from Merton in an excursion train, and had been travelling all night. He had an umbrella under his arm, and two great straw baskets in each hand, which contained, when unpacked, a cold leg of mutton, half-a-dozen of beer, a bottle of port, and all sorts of pasties and luxuries. We had a great day together, and when he rejoined his excursion in the evening he left a very much cheerier man than he had found. Talking of cheeriness, you misunderstand me, Bertie, if you think (as you seem to imply) that I take a dark view of things. It is true that I discard some consolations which you possess, because I cannot convince myself that they are genuine; but in this world, at least, I see immense reason for hope, and as to the next I am confident that all will be for the best. From annihilation to beatification I am ready to adapt myself to whatever the great Designer’s secret plan my be. But there is much in the prospects of this world to set a man’s heart singing. Good is rising and evil sinking like oil and water in a bottle. The race is improving. There are far fewer criminal convictions. There is far more education. People sin less and think more. When I meet a brutal looking fellow I often think that he and his type may soon be as extinct as the great auk. I am not sure that in the interest of the ‘ologies we ought not to pickle a few specimens of Bill Sykes, to show our children’s children what sort of a person he was.